Eco-Friendly Cleaning solutions for the remediation of contaminated soil, water and hard surfaces. EDS Solutions is the manufacturer of Ecokleen water-based degreaser for medium to heavy-duty degreasing requirements. Absorbents are used in the handling of hydrocarbons and chemicals that are spilled in an area where the use of water is not possible. Petrozorb is applied to the contaminated area. It consists of organic fibres containing oil eating microbes (OEM) that absorb and remediate the contaminated area, for example, soil, water or hard surfaces. Grit Hand Cleaner is a blue, waterless hand cleaner containing grit (sodium) and a skin conditioner, so it functions as an emollient and a soluble scrubber. Grit Hand Cleaner acts against the heaviest soils, fats, grease, oil, ink, etc. without using harsh alkalis and abrasives. This hand cleaning product is economical, non-toxic and 100% active. Eco Degreaser’s multi-purpose cleaner is organic so it does not allow bacteria to mutate, whereas parasites develop immunity to synthetic chemicals and can eventually survive of these chemicals. Natural oils have the ability to cover bacteria virus and various insect larvae, by plugging the pores they breathe through, thereby suffocating the organism. Biodegradability starts immediately and, depending on weather conditions, biodegrades within seven days. Eco Degrease and Seperation Solutions offers a complete environmental solution by way of its eco-friendly, water-based degreaser / cleaning chemicals, absorbents and spill kits. 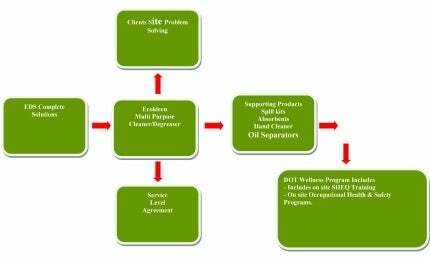 These solutions will ensure that your site is ISO:14001 compliant. Ongoing research and development on the company’s consumable product range will render EDS at the forefront of latest technical, cost-effective solutions that truly work. EDS identifies this as its ‘long-term financial investment’ between the company and its valued clients and, most importantly, contributing toward minimising your carbon footprint. Eco Degrease and Seperation Solutions offers water-based degreasers that are effective, safe and environmentally friendly. EcoKleen Advance is an ultra-high performance water-based, alkaline, degreasing fluid specifically designed for demanding industrial applications. Grit Hand Cleaner is a blue, waterless hand cleaner with grit, containing a skin conditioner, an emollient and a soluble scrubber. It acts against the heaviest soils, fats, grease, oil, ink, etc. without resorting to harsh alkalis and abrasives. Eco Degrease and Seperation Solutions' multi-purpose cleaner being organic, does not allow bacteria to mutate, as parasites develop immunity to chemicals and can eventually survive off these chemicals. PèTROZORB (pronounced peat-ro-zorb) is the name of a series of absorbent products. Their characteristics allow for rapid absorption and vapour suppression for petroleum hydrocarbons and hydrophobic chemical spills on water and land surfaces. Eco Degrease and Seperation was asked by a client to supply degreaser products that could improve the performance of the current oil separators while providing a similar or better performance than the current product.